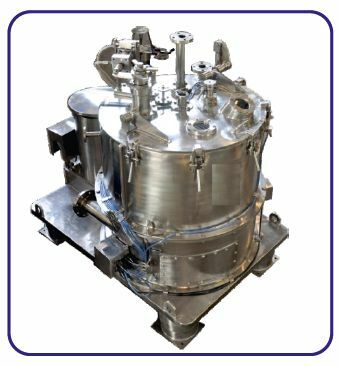 The process of Filtration is similar to other types of centrifuges, the difference being in the method of unloading the Solids. The Scraper cuts the Solid cake while the basket is rotating at a slow speed. The solids are discharged through openings provided in the Basket bottom and Bottom Base / Inertia Plate. FEEDING : A filter media is fixed to the cylindrical surface of a perforated basket. The feed slurry is directed to the basket wall using a feed pipe. Feeding is carried out while the basket is rotating at an appropriate speed. After the required cake is built, feeding is stopped. The centrifuge is run for some time to partially de-water the solids. Feeding can be repeated if there is adequate space for further build up of cake. WASHING : After feeding, washing is carried out by pumping wash liquid through the wash pipe. SPINNING : The basket is run at the spinning speed to complete the de-watering process. SCRAPING : The speed of the basket is reduced to the scraping speed (slow speed). A scraper knife cuts the solids, discharging them through the chute. HEEL REMOVAL - OPTIONAL : Some material remains on the filter media after scraping and is called residual heel. This heel can be removed by using the heel removal system. CLEANING IN PLACE - OPTIONAL : The centrifuge can be cleaned using a CIP system. Design : The bearing housing is completely isolated from the solvent vapours or mother liquor, preventing the chances of corrosion of bearings. This design eliminates the need to access below the Inertia Plate / Bottom trough (difficult in a Bottom discharge with large central opening) for dismantling the Bearing Housing. Also, the bearing housing can be removed easily without dismantling connections like grease pipe and Nitrogen Blanketing.